Penetration of the Siegfried Line by the 47th Inf.Rgt., 9th Inf. Div. After the rapid pursuit of the enemy through France and Belgium, the 47th Inf. Regt., at noon on Sept. 13th, bivouacked about five kilometers SW of the Siegfried Line in the vicinity of (8328). In the early afternoon a light rain began to fall, mounting steadily to a drenching downpour which continued without let-up for about twenty-four hours. On the morning of the 14th, the Regiment moved out in a column of battalions, the leading elements crossing the IP, RJ (863278), at 0800, with the ultimate objective of seizing road centers at DÜREN (115463) in conjunction with the 39th Inf. on the right. A patrol, consisting of one squad from the Regimental I&R platoon and 2 tanks. 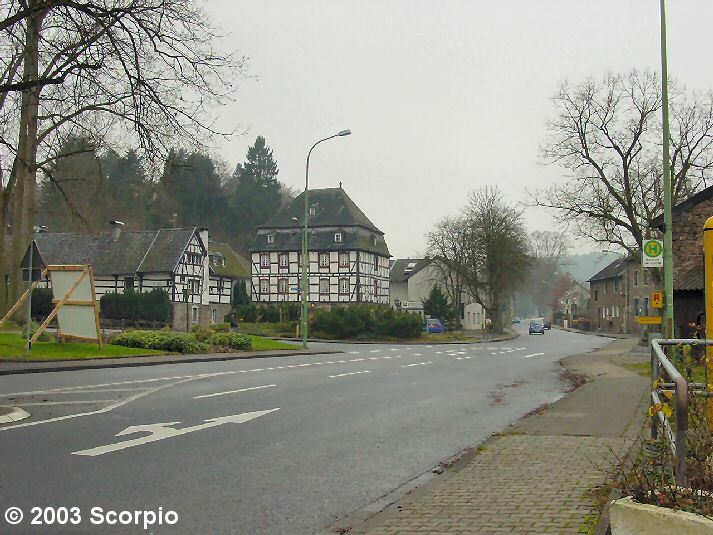 preceded the battalions, and crossed the German border at ROETGEN (905285) at 0830. 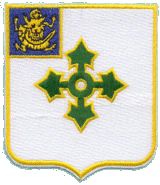 The order of march was 1st bn., 3rd bn., 2nd bn. (less Company "G" which was on a special mission at VII Corps Hqs), until RJ (919303) was reached, at which time the 1st Bn., followed by the 2nd, continued North toward ZWEIFALL (957365) while the 3rd Bn. turned East along the road to RJ (978314). The leading company of the 1st Bn., Co. "B", was mounted on the attached 5 tanks and 4 TD's, with companies "A" and "C" following on foot. 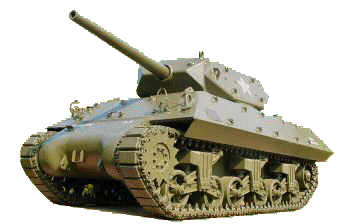 The 3rd Armored Division was immediately ahead of the reconnaissance patrol preceding the 1st Bn. and turned North at MULARTSHÜTTE while the battalion continued NE toward ZWEIFALL (957365). Upon entering the town, the recon patrol found that the only suitable bridge over a stream flowing through the town had been blown, and at the same time, captured one prisoner who said he was a member of a group whose mission it was to demolish bridges on our route of advance. The 1st Battalion, on reaching the site of the blown bridge, deployed over an area of about 300 yards in the vicinity of the road while a detachment from Co. "B", 15th Engineer Battalion, immediately began construction of a temporary bridge. Later in the afternoon, Co. "B", after having dismounted from the tanks and TD's, forded the stream and proceeded to a point about 1000 yards North of ZWEIFALL, where they established road blocks and defensive positions. 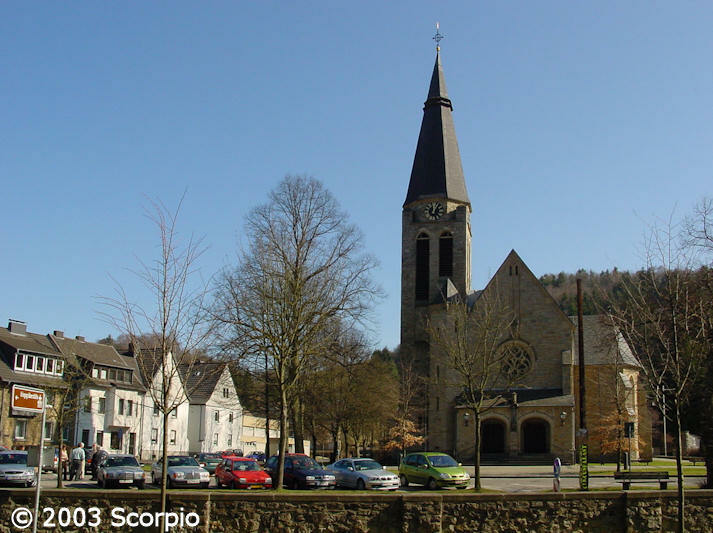 The battalion was then ordered to remain in ZWEIFALL and allow the 2nd Battalion to pass through it. A patrol consisting of the 1st Battalion S-3, Tank Officer and Engineer Officer reconnoitered the route to VICHT (961390) and found a bridge blown just South of the town. That night the artillery, 4.2 and 81mm mortars, and the TD's fired on pillboxes at (963394) in the vicinity of VICHT. None of the concrete fortifications encountered by the 1st Battalion during the day's advance had been manned, and resistance was limited to sporadic SA fire which was speedily overcome. Nine prisoners were taken in these small contacts. 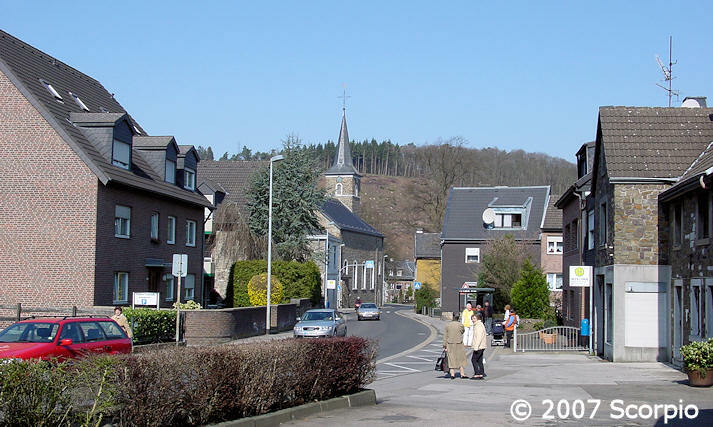 The 2nd Battalion entered ZWEIFALL, passed thru the 1st Battalion, and after crossing the stream over an undamaged culvert, turned right on the road leading SE from the town. Two pillboxes were passed which showed signs of recent occupation and, while advancing to RJ (978355), several shots were heard to be fired from another pillbox in the vicinity. One of the attached tanks fired a 76mm round in the direction from which the sound came and advanced swiftly under its own MG fire. When the fortification was reached, a wood fire was found burning, along with potatoes prepared for cooking, but the occupants had fled. About 1500 hrs., the Battalion C.O. detailed the S-2 to proceed due South from RJ (978355) with a small task force to contact the 3rd Battalion before dark, if possible. The task force, composed of one medium tank, fifteen infantrymen and a platoon leader from Company "F", one section of heavy MG's and the battalion intelligence section, proceeded on its course along the assigned route until the lead scouts heard some activity in the pine trees about 100 yards to the West of the road. Approaching the scene of the disturbance cautiously, the scouts discovered a large German kitchen truck bogged down on a narrow path leading over a hill. While the Germans labored in a vain effort to free the vehicle, the infantrymen quickly and silently formed a semi-circle about the truck while the heavy MG's set up farther South to cover the road. On a given signal, the tank started to move up and the infantrymen closed in, calling upon the Germans to surrender. One of the enemy opened up with his rifle and was cut down with fire from M-1's, BAR'S and hand grenades. The tank, by this time, was in position, and opened fire on the truck, setting it aflame. Two Germans were killed, two wounded and the other two fled into the surrounding woods. As dusk was fast approaching, the force reassembled, radioed back the situation, and returned to the battalion area for the night.